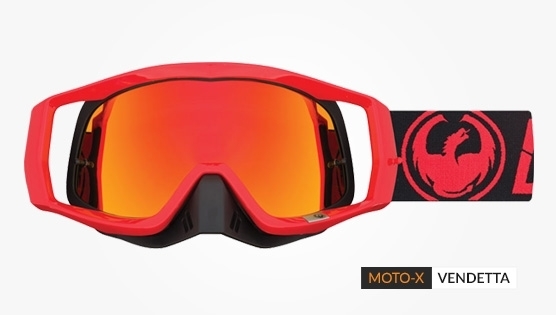 A lightweight one-piece outer-mask frame and a durable polyurethane inner frame create the Dragon Vendetta MX goggles. This is a beast of a goggle. The Vendetta Motocross Goggles are lightweight and durable, with a unidirectional airflow system that boosts anti-fog by only allowing air in through one port and out via another. It's a one-piece outer-mask frame made from ABS/PC and a durable polyurethane inner frame. Together they create an industry leading outrigger, enabling the goggle to sit further back on the helmet and providing a great seal. Quad foam and moisture wicking micro-fleece face foam for a comfortable and precise fit. The silicone beaded adjustable strap keeps the goggles securely in place on the helmet.